FireKing's 25 Series Vertical Fireproof File Cabinet has the same great protective features of the standard fireproof vertical cabinet, but is smaller and comes at a more affordable price. At just 25" deep, the cabinet fits into tight spaces in your classroom or office. This heavy-gauge steel file cabinet features insulation, reinforced by a 14-gauge galvanized steel wire lattice, that protects against fire, impact and explosion. The cabinet is one-hour UL-fire rated, 30' UL impact rated and ETL-verified water resistant. Each of the four legal-size drawer heads is filled with fireproof insulation. Insulation between the drawers makes each one a separate insulated container. The drawer bodies have high sides for use with hanging files (no frames required). Comes with a UL-listed, high-security Medeco key lock. This FireKing 25 Series Vertical Fireproof File Cabinet with Four Legal-Size Drawers is made in the USA and comes backed by a limited lifetime warranty. FireKing's 25 Series Vertical Fireproof File Cabinet has the same great protective features of the standard fireproof vertical cabinet, but is smaller and comes at a more affordable price. At just 25" deep, the cabinet fits into tight spaces in your classroom or office. This heavy-gauge steel file cabinet features insulation, reinforced by a 14-gauge galvanized steel wire lattice, that protects against fire, impact and explosion. The cabinet is one-hour UL-fire rated, 30' UL impact rated and ETL-verified water resistant. Each of the four letter-size drawer heads is filled with fireproof insulation. Insulation between the drawers makes each one a separate insulated container. The drawer bodies have high sides for use with hanging files (no frames required). Comes with a UL-listed, high-security Medeco key lock. This FireKing 25 Series Vertical Fireproof File Cabinet with Four Letter-Size Drawers is made in the USA and comes backed by a limited lifetime warranty. FireKing's 25 Series Vertical Fireproof File Cabinet has the same great protective features of the standard fireproof vertical cabinet, but is smaller and comes at a more affordable price. At just 25" deep, the cabinet fits into tight spaces in your classroom or office. 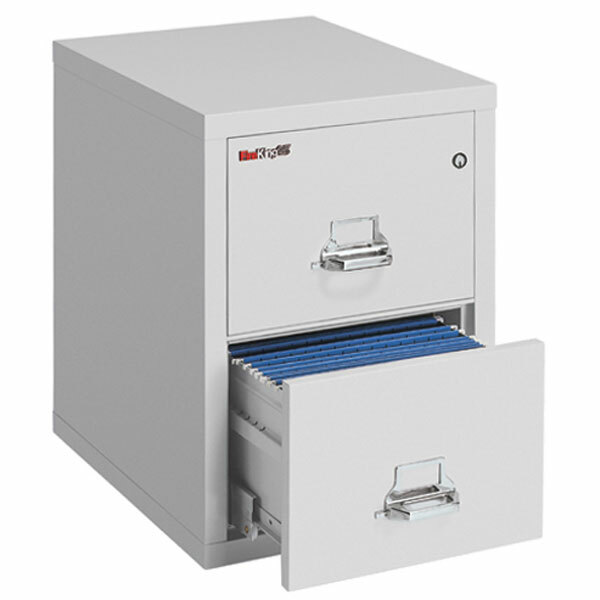 This heavy-gauge steel file cabinet features insulation, reinforced by a 14-gauge galvanized steel wire lattice, that protects against fire, impact and explosion. The cabinet is one-hour UL-fire rated, 30' UL impact rated and ETL-verified water resistant. Each of the two legal-size drawer heads is filled with fireproof insulation. Insulation between the drawers makes each one a separate insulated container. The drawer bodies have high sides for use with hanging files (no frames required). Comes with a UL-listed, high-security Medeco key lock. This FireKing 25 Series Vertical Fireproof File Cabinet with Two Legal-Size Drawers is made in the USA and comes backed by a limited lifetime warranty. FireKing's 25 Series Vertical Fireproof File Cabinet has the same great protective features of the standard fireproof vertical cabinet, but is smaller and comes at a more affordable price. At just 25" deep, the cabinet fits into tight spaces in your classroom or office. This heavy-gauge steel file cabinet features insulation, reinforced by a 14-gauge galvanized steel wire lattice, that protects against fire, impact and explosion. The cabinet is one-hour UL-fire rated, 30' UL impact rated and ETL-verified water resistant. Each of the two letter-size drawer heads is filled with fireproof insulation. Insulation between the drawers makes each one a separate insulated container. The drawer bodies have high sides for use with hanging files (no frames required). Comes with a UL-listed, high-security Medeco key lock. This FireKing 25 Series Vertical Fireproof File Cabinet with Two Letter-Size Drawers is made in the USA and comes backed by a limited lifetime warranty. In search of a fireproof cabinet that fits your space and budget? FireKing's 25 Series Vertical Fireproof File Cabinet has the same great protective features of the standard fireproof vertical cabinet, but is smaller and comes at a more affordable price. At just 25" deep, the cabinet fits into tight spaces in your classroom or office. This heavy-gauge steel file cabinet features insulation, reinforced by a 14-gauge galvanized steel wire lattice, that protects against fire, impact and explosion. The cabinet is one-hour UL-fire rated, 30' UL impact rated and ETL-verified water resistant. Each of the drawer heads is filled with fireproof insulation. Insulation between the drawers makes each one a separate insulated container. The drawer bodies have high sides for use with hanging files (no frames required). Comes with a UL-listed, high-security Medeco key lock. This FireKing 25 Series Vertical Fireproof File Cabinet is made in the USA and comes backed by a limited lifetime warranty. Call (877) 839-3330 and a member of our customer service team will be happy to help you with your order for fireproof cabinets or any school furniture. One or more required options were not selected. Please select all required attributes before adding this item to your cart.